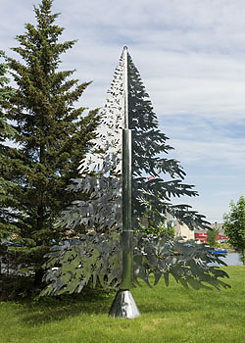 Sorel is a small town on the south bank of the Saint Lawrence River just 40 km east of Montreal, and it may surprise readers to learn it was in Sorel that the Christmas tree had its first appearance on North American soil. The local history cites a description from Christmas Eve 1781 at the house of Major General Friedrich Adolphus von Riedesel and his wife, the Baroness Friederike Luise von Riedesel (Born von Massow). Von Riedesel had invited a small group of German and English officers over to his house in Sorel that evening as guests. According to the Baroness von Riedesel’s biographer Max von Eelking, they celebrated Christmas Eve in the salon, and in the corner stood “a Christmas tree with the branches decorated with fruit and lit with candles”. This interesting note on the celebration in Sorel was written 50 years after the event. Unfortunately, there is no mention of this specific detail in the numerous writings of the Baroness herself. So was it just creative license or actual fact? So was it just creative license or actual fact? The first sources on the existence of the Tannenbaum or Weihnachtsbaum, as the Christmas tree is called in German, refer to a 1605 manuscript from Strasbourg in the Alsace region. It’s therefore certainly possible that the tradition of decorating a coniferous tree for Christmas made it over to Sorel, Quebec 175 years later with the German general, spreading throughout the whole continent from there. In any event, there isn’t yet any convincing proof of the story’s historical accuracy, according to the Sorel historian Mathieu Pontbriand, who has dealt intensively with this story. However, this detail doesn’t really bother the inhabitants of Sorel, and they are still just as proud as ever of their role in spreading the Christmas tree through the New World. Leaving aside the story of the Christmas tree, there is still the question of what a high-ranking Prussian officer and his wife were doing in the small Quebecois town of Sorel in the middle of the 18th century. Christmas trees in Sorel | © Goethe-Institut Montreal At least on this point, there are enough primary sources in agreement with each other. They give an illuminating glimpse into a lesser-known facet of the relationship between the German Empire and the newly-established British colony of Canada. After the end of the Seven Years’ War, France had to give up its colony in North America to the British as part of the Treaty of Paris in 1763. In order to protect this new English colony from attacks by American revolutionaries as part of the War of Independence (1776-1783), King George III of England (and a member of the German House of Hanover) dispatched an army of German mercenaries without further ado. But why did he hire German soldiers, of all people? He wanted to avoid a situation where English soldiers had to fire on English soldiers, as America had been a British colony before the War of Independence. As a result, between 7,000 and 10,000 German mercenaries, then called “Braunschweigers”, came to Quebec under the command of Major General von Riedesel to defend the English throne. Of the mercenaries who survived to the end of the war, approximately 2,500 remained in Canada. About 1,400 of the men settled in the Saint Lawrence valley and started new families there, mostly with franco-canadian women. According to official statistics, at the end of the 18th century, around 10% of all francophone Quebecers’ ancestors were of German heritage. Within one generation, these first German “immigrants” were completely assimilated, and their last names were almost all adapted to French. At the time, approximately 20% of all doctors in Quebec were of German descent, most of them former military doctors. In fact, the German doctor Henri Pierre Loedel was the founder of Montreal General Hospital and of the Faculty of Medicine at the renowned McGill University. Whether we’re talking about Christmas trees or family trees, there are numerous genetic and historical traces of Germany within Quebec’s francophone population, thanks in part to the expeditionary army of Mr. von Riedesel. Built in 1781, his house (the Maison des Gouverneurs) is listed as a historic monument in Sorel, where you can visit it and its Christmas tree-salon.